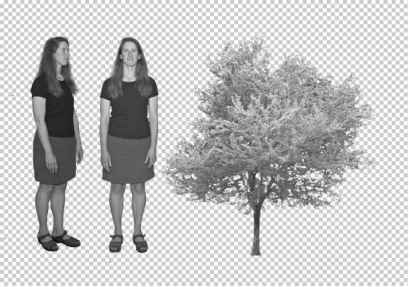 The next four blending modes—Lighten, Screen, Color Dodge, and Linear Dodge—all lighten the underlying image, and for this reason they are often referred to as the Lighten group. Just as the Darken modes have white as their neutral color, the Lighten group of modes have black as their neutral color, which is why they are also sometimes known as the neutral black group. The Lighten blending mode is the exact opposite of the Darken mode. Both create a new output color by comparing the base and the blend color information in each channel. While Darken selects the darker of the base or blend color, Lighten chooses the I ighter of the base or blend color. Its effect is more obvious with lighter blend colors. Adding Gaussian blur to the Lighten blend layer lightens and blurs the image, and creates a rim or halo around the reversed shadows. Applying Lighten to an inverted copy reverses the shadows. 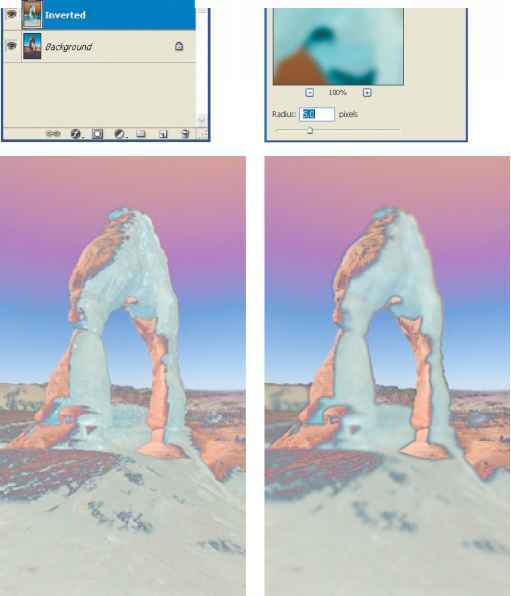 Inverting the blend layer incurs unusual shifts in color, producing a negativelike image. This shot was taken at the end of a trip. 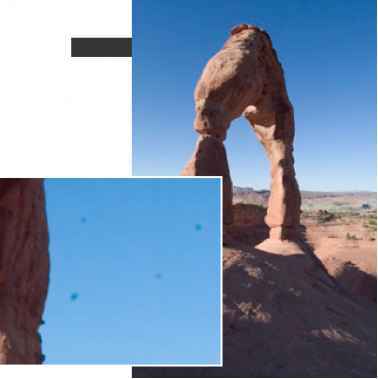 Unfortunately, the digital SLR's sensor had collected particles of dust, which have become especially visible in this picture of southern Utah's clear, blue sky. 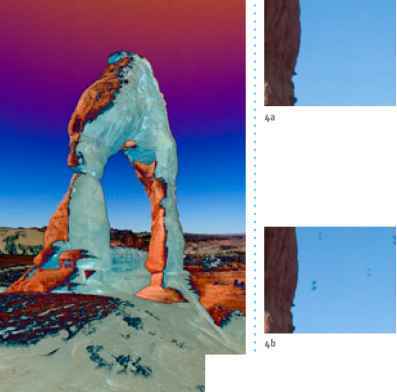 Applying a Lighten mode to a slightly offset duplicated patch of sky results in Photoshop selecting the lighter color from the base and blend layers, thus banishing the darker spots. 6 Select the Move tool (V).